Carolina Baptist newspaper masthead from September 2, 1857. Thanks to our partner, Wake Forest University, there are 19 new newspapers added to DigitalNC. Dating from 1857 to 1925, these newspapers were written for Christian communities from the mountains to the Piedmont to the coast of North Carolina. Most of the newspapers are affiliated with the Baptist denomination, and their audiences vary in size and geography. Some were published for specific churches, like the Broad Street Worker “Devoted to the interests of Broad St. Baptist Church” in Winston, N.C. Others were published for a wider audience by regional, state, or national organizations, like the North Carolina Baptist Missionary Worker and The Gospel Herald published by the Boards of the Baptist State Convention, and the Conflict published by the Anti-Evolution League of America. To see other materials from Wake Forest University, visit their partner page or their website. 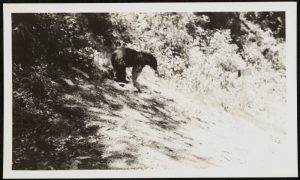 Bear cub on a hillside. 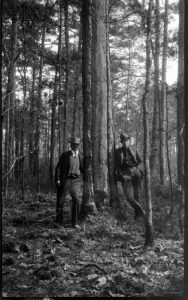 County Warden Bardel and District Forester Kimball pose by a tree in 1926. Photographs and vertical files from our newest partner, The Forest History Society, are now online at DigitalNC. 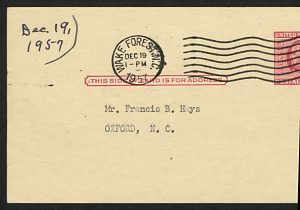 The Forest History Society is a nonprofit organization located in Durham, North Carolina, that is dedicated to the collection and preservation of materials concerning forest history and conservation. The Forest History Society represents information about forestry around the world, but the materials now up on DigitalNC are specific to North Carolina. Vertical files from this batch cover topics like forestry schools in North Carolina, the Cherokee National Forest, the Pisgah National Forest, the Southern Forest Experiment Station, the effects of Hurricane Hugo, Fran, Hortense, and Bertha on NC forests. Each vertical files contain a range of materials such as newspaper clippings, pamphlets, maps, images, reports, press releases, magazine articles and correspondence. Materials in the files are text searchable and provide a great overview of forestry issues in North Carolina. The images in this batch also document a wide variety of subjects related to forestry. Fire prevention is one major theme of this image collection with photographs of fire towers, forest fire prevention signs, and fire control exhibits. There are also images of different tree and plant species, nurseries and planting efforts, tree damage and disease, and portraits of foresters, wardens, and rangers. To browse through all of these materials, visit The Forest History Society’s partner page, and learn more by visiting their website. 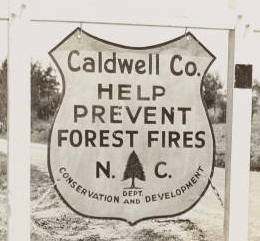 One of the many fire prevention signs in the image collection. 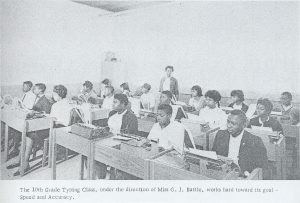 A 10th grade typing class in 1967 at the G.C. 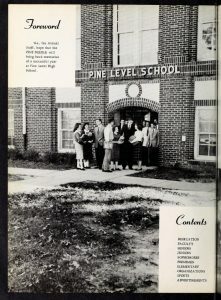 Shaw High School class in Stovall, N.C.
Several new high school yearbooks from Granville County are now online on DigitalNC, provided by our partner Granville County Public Library. Included are two years of The Hornet by G.C. Hawley High School from 1967 and 1968, the 1967 Pep Pac by Henderson High School, the 1967 Wildcat by J.F. Webb High School, and the 1967 The Pirate by G.C. Shaw High School. The yearbooks contain individual school portraits, group portraits, and photographs of sports, activities and school groups. 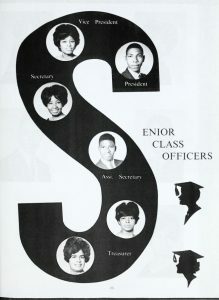 A collage of the 1967 senior class officers at G.C. Hawley High School. To learn more about Granville County Public Library, visit their partner page or take a look at their website. Almost two decades of the newspaper The Carolina Indian Voice, from 1977-1996, are now up on DigitalNC. Provided by our partner, UNC at Chapel Hill, this batch joins previously digitized issues that date from 1996-2005. The Carolina Indian Voice was established in 1973 and continued through 2005, so now nearly the entire print run is digitized. The Carolina Indian Voice is one of North Carolina’s oldest American Indian newspapers. It served members of the Lumbee Tribe living in Robeson County including the town of Pembroke, which is the seat of the Lumbee tribe of North Carolina, as well as the home of The University of North Carolina at Pembroke, a historically American Indian University. 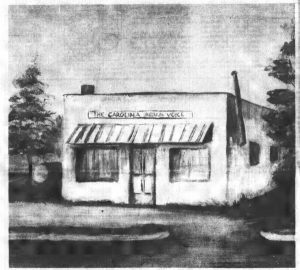 The Carolina Indian Voice was published weekly on Thursdays and was a source for all sorts of local news. Topics covered included local politics and civic issues, cultural events, school happenings, and more. Articles on local and national civil rights issues and efforts to end racial discrimination pertinent to Robeson County’s American Indian population were also covered alongside everyday happenings in the county. Click here to take browse through the digitized issues. To see more materials from our partner UNC at Chapel Hill, visit their DigitalNC partner page or take a look at their website. Over forty years worth of campus catalogs from South Piedmont Community College are now online at DigitalNC. They cover admissions, student registration for classes, financial aid, scheduling, and the lists of programs and classes. 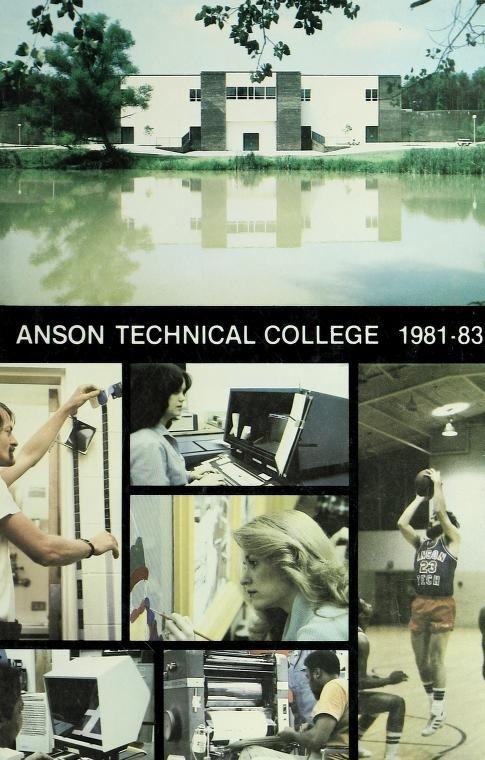 The Anson Technical College Catalogue for 1981-1983. These campus publications range from 1972 to 2017. In the 1970s, it was still called Anson Technical Institute, but the name was later changed to Anson Technical College in 1979 and Anson Community College in 1987. In 1999, South Piedmont Community College was created out of Anson Community College and Union Technical Education Center, in order to serve both Anson County and Union County, where the campuses still serve today. Also included is a commemorative program for Donald Altieri, who served as former President of the college from 1993-2003. Click here to browse through the SPCC catalogs. To learn more about South Piedmont Community College, visit their partner page, or take a look at their website. 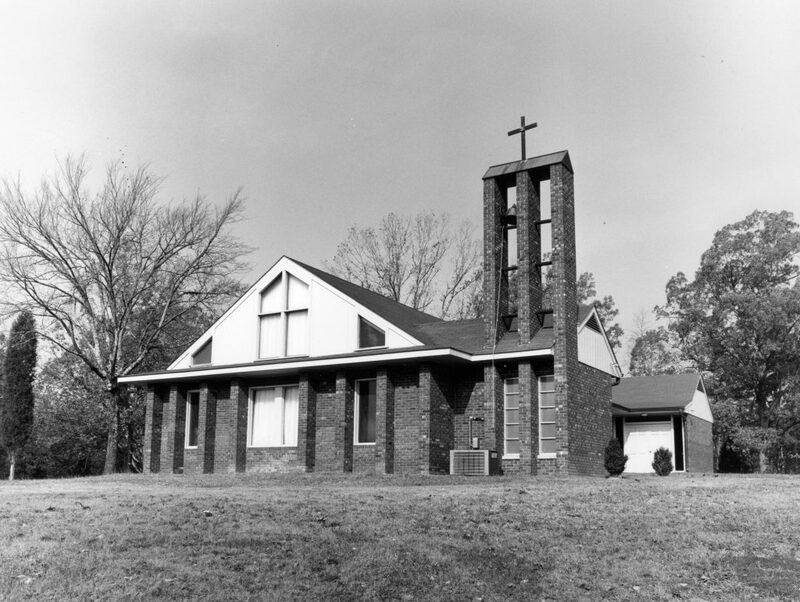 Outside view of the Strieby Congregational Church in Asheboro, N.C.
A new batch of photographs from Randolph County have been digitized and are now online at DigitalNC, courtesy of our partner Randolph County Public Library. Included is nearly a dozen photos from various people and places in Randolph County, including Strieby and Asheboro. The materials are part of our effort to highlight underrepresented groups in North Carolina. There are also several documents that have been digitized, including interviews and newspaper articles that stretch from the 1950s to 2013. They primarily cover the civil rights movement in Randolph County, including sit-ins at the Walgreens, Hop’s Bar-B-Que and a theatre in Asheboro. 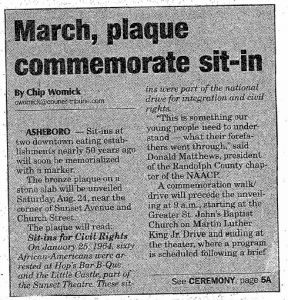 Several of the articles are about the commemoration of a plaque in Asheboro to memorialize the sit-in campaigns throughout Randolph County. Reading these articles help give us perspective on the long lasting change and impact of the civil rights movement in North Carolina. Articles about the growing Latino community in Asheboro and Randolph county are also included and can be seen here. The photos from Randolph County are available here, and the articles are available here. 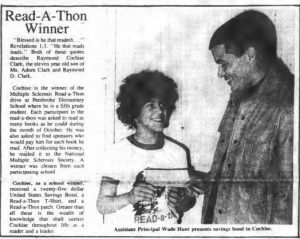 To view more photos and documents from Randolph County Public Library, click here to view their partner page, or take a look at their website. 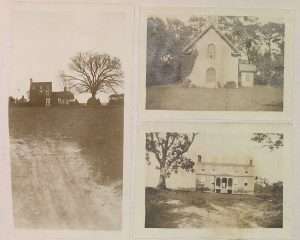 Photos of different buildings by Mrs. Addie Wood. The church (top right) was built in 1754. 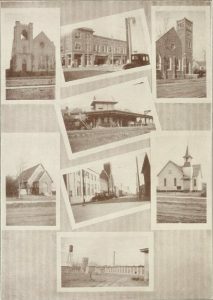 Volumes 135 through 140 of the Francis B. Hays Collection of scrapbooks from Granville County Public Library are now up on DigitalNC. These scrapbooks add to the extensive collection of volumes compiled by Mr. Hays, an avid local historian from the Granville area. Each scrapbook contains a wealth of information relating to a specific subject, and many contain notes and letters written by Mr. Hays himself. This batch of scrapbooks focuses mainly on family genealogies. 1957 letter addressed to Francis B. Hays. 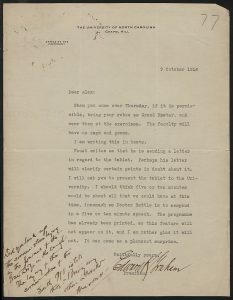 Letter to Mr. Hays about ancestral information on the Duty family. Volume 135 is the church book for Granville Circuit, including rolls of congregants dating back to 1836. Also included are the church programs for Oxford Methodist Church in Oxford, NC from September 1941 to June 1942. Volumes 136 through 140 are various genealogies for local families, including information on family records, marriages, newspaper clippings, and photographs dating back to the 17th century. 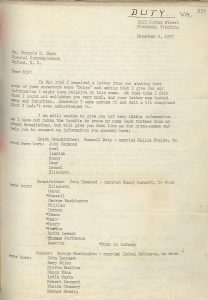 Also included are various personal letters to Mr. Hays. For more scrapbooks compiled by Francis B. Hays, you can visit the DigitalNC page for the Francis B. Hays Collection or view our previous blog posts on the collection. You can also see more materials from the Granville County Public Library partner page. 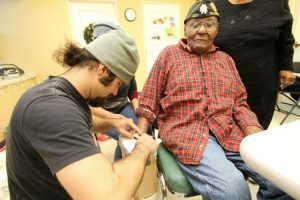 Artist Aaron Wallace casts the hand of veteran Will A. Harrison from Guilford County. 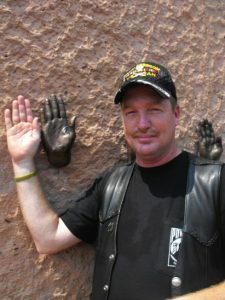 Veteran Timothy Morton from Stanly County pictured with the cast of his hand at the North Carolina Veterans Park. Materials from each county are represented individually on DigitalNC, and include information about the veterans, community members, and artists that facilitated the casting. Many include photographs of the hand molding process and biographical details. To browse materials in the North Carolina Veterans Park collection, click here. To learn more about the Arts Council of Fayetteville/Cumberland County, take a look at their partner page, or visit their website. A new batch of materials from our partner, The Grand Lodge of Ancient, Free and Accepted Masons of North Carolina are now up on DigitalNC. This set includes minute books, scrapbooks, historical manuscripts, letters and charters, some dating back to the 18th century. Several physical artifacts have been digitized, including a commemorative apron and a souvenir pin from the turn of the 20th century. 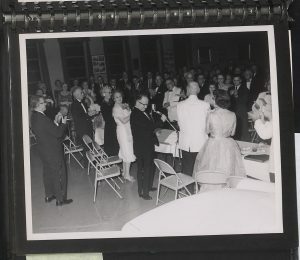 A celebration for the installation of James Brewer as Grand Master in 1961. The minute books are from all around the state, including Chapel Hill, Charlotte, Statesville and Boone. Also included is a letter from Edward K. Graham, President of UNC, to Grand Master Andrews inviting him to the 1916 University Day ceremony. There are also several scrapbooks included, with photographs including receptions and various programs, including the 275th Anniversary of the United Grand Lodge of England in West London in June 1992. 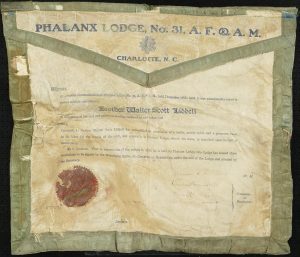 To see more materials from The Grand Lodge of Ancient, Free and Accepted Masons of North Carolina, visit their partner page or take a look at their website or our previous blog posts.